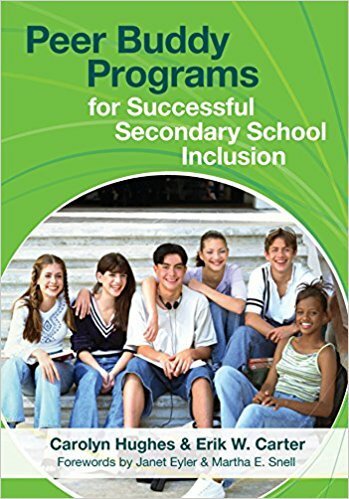 When secondary schools are committed to inclusion, everybody wins—schools make progress toward IDEA and NCLB requirements, and students with and without disabilities enjoy higher academic achievement and new friendships. A good peer buddy program can play an invaluable role in making inclusion happen, and this guidebook shows educators exactly why and how. Carolyn Hughes and Erik Carter, highly respected experts well-known for their work with peer buddy programs, give schools all the step-by-step guidance they need to get a program started and keep it going. Educators will discover how to: •Establish a peer buddy program and spark student interest •Clarify the roles and responsibilities of everyone involved: teachers, counselors, administrators, parents, and students •Create successful peer-buddy matches using students' strengths, needs, and common interests •Develop smooth procedures for day-to-day program implementation •Guide peer buddies in providing appropriate, effective academic support •Promote inclusion in social arenas such as school clubs and the lunchroom •Assess and expand the program, incorporating participant feedback To help with every phase of program implementation, readers will also get a wealth of practical, research-based materials: extensive case examples, program checklists, suggested classroom adaptations, sample forms such as peer buddy applications and evaluation tools, and learning activities school staff can use to brainstorm and solve problems. With the proven program model in this one-of-a-kind guide, educators will transform secondary schools into caring and compassionate communities where all students help each other learn.